18세기 말에 제작된 한양 지도이다. 도봉산과 북한산을 배경으로 하면서 백악산(白岳山)·인왕산(仁王山)·목멱산(木覓山, 남산)·타락산(駝駱山, 낙산)의 내사산(內四山)을 중심으로 한양의 빼어난 자연 환경을 산수화처럼 그렸다. 정확한 제작 시기는 미상이지만, 1785년에 설치되었다가 1802년에 폐지된 장용영(壯勇營)이 종묘의 오른쪽에 그려져 있는 것을 통해 이 지도가 18세기 말에 제작되었음을 추정할 수 있다. 지도는 남쪽을 바라보며 정사(政事)를 살피는 국왕의 시각에 맞추어 남쪽이 지도 상단으로, 북쪽이 지도 하단으로 배치되어 있다. 도성 안 시가지의 인문(人文) 현상은 평면적으로 처리했고, 풍부한 지명을 기록하여 주위의 산세와 대비되도록 하였다. 여백에는 행정 구역, 도성의 크기와 도로 상황 등을 기록했는데, 당시 법궁(法宮)이었던 창덕궁의 돈화문(敦化門)을 기점으로 삼았다. 화면구성, 필법, 준법, 수지법, 채색 등 일반적인 산수화에서 사용되는 모든 기법을 충실하게 구사하면서 회화적인 표현에 많은 관심을 기울인 작품이다. 18세기 유행한 정선(鄭敾, 1676-1759)의 진경산수화풍을 따르고 있으며 회화성이 탁월하다. This map, in the collection of the Kyujanggak Institute for Korean Studies at Seoul National University, presents a general view of Hanyang, present-day Seoul, in a circular composition in reverse direction. 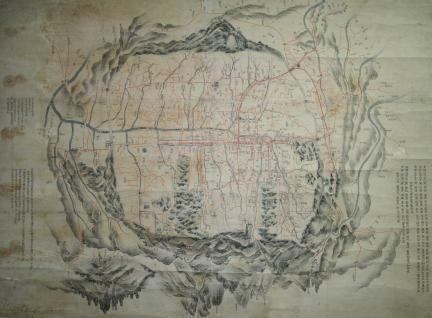 Given that Mongmyeoksan Mountain (Namsan) in the south of the capital is depicted at top and Samgaksan and Dobongsan Mountains in the north at bottom, the map is assumed to have been produced for use by the king, who looked out at the capital from his palace in the northern end of the city. The Map was produced in the landscape painting style, particularly the true-view landscape style of Jeong Seon (1676-1759), faithfully employing diverse techniques for composition, brushwork, texture strokes, tree branches technique and coloring. This resulted in outstanding painterly quality. The map has the Royal Guards Garrison, located at the right-hand side of the Jongmyo Shrine. Considering that the special military command was installed in 1785, during the reign of King Jeongjo, and abolished in 1802, it can be assumed the map was produced sometime around the late 18th century.